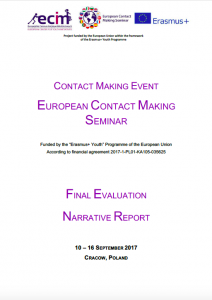 5th publication, fully prepared by European Center for Youth Initiatives, based on the implementation process of ‘European Contact Making Seminar’ project in cooperation with partners from Bulgaria, Croatia, Cyprus, Denmark, France, Germany, Hungary, Italy, Portugal, Romania, Slovak Republic, Slovenia and Spain under Erasmus+ Youth Programme. Report showing the whole process, tasks within activities, their aims, is using data collected during Youth Exchange implementation, daily evaluations made by participants, online questionnaires results as well as photos and graphics showing character and category of each activity. Publication is one of the key elements of complex project evaluation. I enjoyed the project really much. I think the project topic is really important and I think its objectives have been fulfilled. I like how much effort the hosting organization put into the project. I liked their energy and their openness to everyone’s opinion, contribution, and suggestions. I also liked the energy of the group. The whole project really influenced me in the positive way. I learned to be more relaxed with new people and to feel free to express my ideas, feeling more confident. I liked the workshops and activities, especially those spent in the park, energizers, and all of the time we spent together. European Center for Youth Initiatives (ECIM) is doing a great job in widening horizons and delivering opportunities to youth in Poland and abroad. ECIM is one of the most reliable partners we have when talking about international cooperation. Their sense of initiative and dedication to do the difference in the lifes of youth is just incredible and we are proud to admit that exchange of good practices and its implementation in our local environment works surprisingly good! It was a pleasure for me to take part on this project and a very good opportunity to know people from different european countries. I really learnt to be organised, to be participant and self-confident, to get different skills and competences. The project was perfectly planned, every activity was very motivating and interesting and I really thank to the organisators their hardwork and initiative to make it possible. Thank you very much to the organizing team for every thing, hospitality, the way you manage the activities and for the way you have adapted during the project to our needs. Thank you all for sharing knowledge, opinions and because you are open for future collaborations. I wish to all of you good luck in future projects, activities and we invite you in Romania to our Associations EuroDEMOS and Kasta Morrely. ECIM made a good job organizing this contact making seminar! I’ve got inspired in youth work and mobility, also was able to learn more abot myself, how I handle certain situations, what motivates and what demotivates me. The hospitality was perfect, I enjoyed my time there, definitely will go back to Poland to explore its rich culture even more. Meeting with different foreign organizations and getting to know their aim and work inspired me for future collaboration. Another well organized project! Everything was perfect, accommodation, food, and other facilities which created friendly learn environment. I met here a lot of people and had chance to cooperate with them during interesting workshops, which seriously, gave me personally a lot! ECIM is a very reliable partner and they have organised a great contact making seminar. Ola and Marcin are very enthusiastic and committed to youth work, it was great to have met them in person and I am sure this was just the beggining of a very fruitful partnership. Huge thanks to our hosts, ECIM, for making the whole project happen and run as smoothly as it did. The ECMS gave me the opportunity to meet some intelligent and well-rounded individuals and explore the splendor of Old Krakow. Regarding my personal expectations and objectives for the project, they have been fulfilled at more than 100%. I enjoyed the energy of the whole group and how it helped people, me included, develop our soft skills. During the various workshops provided by the different national groups, I have become more able to deal with conflicts that have arisen, as well as to learn more about myself and my attitude to different types of approach in the non-formal education. Overall, ECMS made me dig deeper into the problems we share among our societies and find practical solutions to them. Also, it was a valuable experience as it motivated me to devote more time and effort for youth work. It was an amazing opportunity for me to take part on this project and learn a lot. I spent a great time with you, developed a lot of my skills by learning and playing. The world of Erasmus opened it’s gate in front of all of us, the project’s objectives have been perfectly fulfilled! Thank you for all the efforts and inspiring work! Hope see you in the future! I was pleasantly surprised by the good organization as well as the accommodation and support provided by the hosting organization. The project activities went very well and we all learned a lot. Connections between the organizations were established or strengthened. And we are all leaving with a sense of satisfaction and looking forward to our future projects and collaboration. I personally consider the project as a successful one, as it is evident that it main aims and objectives have been met to a great extent. The organizers were really good as they manage to deliver while maintaining the group dynamics at a high level. They were organized and well composed, which enabled them to provide us with a fruitful and memorable program. The were joyful and constructive where necessary and eager to provide any assistance deemed necessary to the project’s participants. A thumps up to them and a big thank you for their overall performance, as well as the great experience the provided us by joining their project. I appreciate the professional work of European Center for Youth Initiative(ECIM) during the Seminar! For sure the seminar developed the sustainable partnership between my organization EuroDEMOS and ECIM. Also within the Seminar it was created a great framework to discuss, share and work with the other participants from the other countries! In our future projects we intend to cooperate with the other partner organizations according to the common topics that we discovered during the seminar activities. Special thank from all the heart to the organizers Marcin and Ola! The members of ECIM were attentive and helpful. They organised a project with superb logistics (accommodation, food, etc) and a huge variety of activities and workshops, which gave me an insight into the Erasmus+ projects and the possibilities it has to offer. I met amazing, proactive people and loved the energy created in such a diverse group. Not only that, but we also got the chance to discover the beautiful Krakow and a little of Polish culture. Overall, this seminar was personally fulfilling, and also fun! Always with smile and compassion for the people from the organizer.they gave us more than a happy week ,they brought to us joy and the wonderful memories. Thus if you have the chance to world with them, please don’t let it go. This was my first traimimg course and, i must admit that it was a great experience, seeing all of its people from different parts of Europe was the first time that saw its. Thank you H20 AND ECMS for allowing me to unfold his projects thst I did not know before.